About Dr. Singh – Dr. Arun Singh M.D. One of the most prolific heart surgeons in American history, Arun K. Singh, M.D. was born in India in 1944. At age 7, he endured two bone-shattering accidents, resulting in temporary paralysis of his dominant hand that required years of arduous rehabilitation. Despite missing five years of school due to his incapacitates, his mother tutored him at home and prepared him psychologically for reentry into a limited academic primary school. Unbeknownst to his family at the time, he was dyslexic, a congenital neurological condition that affects the learning process. To the astonishment of his parents and community, he eventually graduated from medical school in his homeland with high honors at the age of 22. He immigrated to the USA in 1967 for surgical training. He was trained at Columbia University, Brown University’s Alpert Medical School and Great Ormond Street Hospital for Children in London. At Rhode Island Hospital in Providence, RI, where he has practiced since 1975, Dr. Singh helped to build a nationally-recognized cardiac surgery program. He has personally performed more than 15,000 documented heart surgeries along with another 5,000 related procedures—more than nearly every surgeon in history. As a professor of surgery at Brown University’s Alpert Medical School, now Emeritus since 2016, he has published more than 150 scientific papers, authored several chapters in medical texts, and given lectures on heart disease and cardiac surgery to professional and lay audiences, both regionally and nationally. He is also an adjunct professor at Bryant University’s Physician Assistant Program. Dr. Singh is a fellow of the American College of Surgeons, the American College of Cardiology, The American Heart Association, the Royal College of Surgeons, and a member of the Society of Thoracic Surgeons, the American Association of Thoracic Surgery and many more national and international societies. 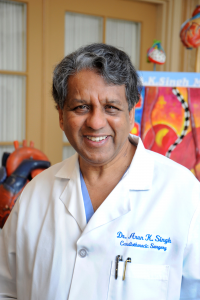 As a physician, Dr. Singh has earned numerous awards, including the American Heart Association “Hero at Heart,” the Dr. Charles L. Hill Award from the Rhode Island Medical Society, and was the inaugural recipient of both the Milton Hamolsky Outstanding Physician Award and Lifetime Achievement Award conferred by the Rhode Island Hospital. Dr. Singh was voted the state’s “Top Doc” in heart surgery for 20 years running. Local politicians, congressional representatives and U.S. senators have honored him with numerous citations. He and his wife Barbara, a native New Yorker, have been married 49 years. They have two sons, Ari and Michael, two grandsons and a granddaughter. The Singhs, who live in Providence, support a number of charities, including his favorites: the Rhode Island Food Bank and the Ekal Vidyalaya Foundation, which develops schools in rural India for underprivileged children. His memoir, Your Heart, My Hands, will be published by the Hachette Book Group in April 2019. To receive prerelease information, please click here. This inspirational memoir is a must have for everyone who likes real-life underdog stories. Preorder your copy of “Your Heart, My Hands” on Amazon today. To book Dr. Singh for an interview or as a guest on a show, contact Katie Broaddus, Senior Publicist, Hachette Book Group. To book Dr. Singh as a speaker, click here. Voted “Best Cardiac Surgeon in RI” by physicians in 1990 and every year since. Listed in “The Best Doctors in America,” 1996-1997. Voted “The Milton Hamolsky MD Outstanding Physician of the Year 2001” (out of 2500 physicians at Rhode Island Hospital). This award was given in honor of Dr. Hamolsky for contributions, dedication, research and leadership in medicine. Voted “America’s Top Doctor – Thoracic Surgeon,” a Castle Connolly Guide, 2003. Listed in “Best Physicians & Hospital for treatment of atrial fibrillation” in Money Magazine, November, 2003. Awarded the “Dr. Charles L. Hill Award” by the Rhode Island Medical Society, 2004. This award was given for dedication, research and contributions in medicine in State. Voted “Rhode Island Monthly – Top Doctors” in May 2005, and every year since. Category: Best Cardiac surgeon In RI. American Heart Association—Hero at Heart, 2006. Lifetime Achievement Award – Rhode Island Hospital, 2014 Lifespan. First Physician to receive the honor. Inducted in Rhode Island Heritage Hall of Fame in 2017.